Lac Serreire – Due to having nobody on last week I decided to have a week’s fishing for the first time since we bought the complex. 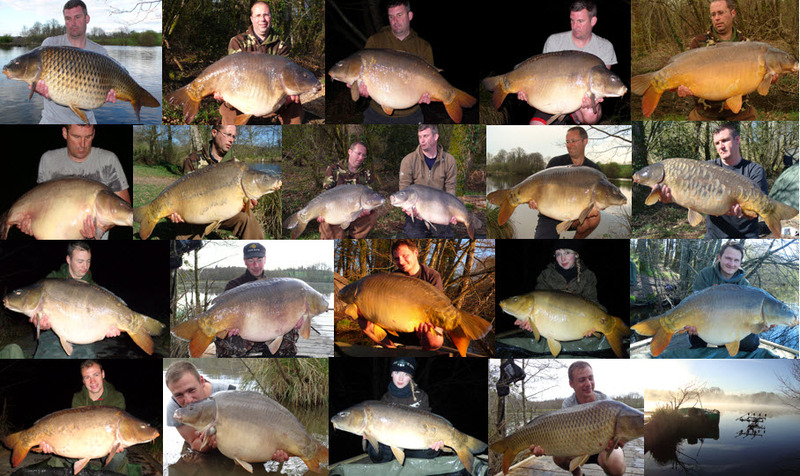 It was a great week with 49 carp landed including 11 forties to 46lb (21kg) showing that November is an excellent month. All the fish were caught from the Outflow swim. Two spots produced all the takes; the dying pads in the outflow corner and a very long range spot at about 170yds towards the inlet stream where fish have been showing over for the last few weeks. Once again Trigga boilies proved to be highly effective. Hook baits were straight forward bottom baits fished on 5″ hook lengths and 2oz leads. Badgers Holt – Moritz & Phil from Germany had a lovely 53lb 14oz (24.5kg) mirror from the right hand side of the main swim on a Trigga boilie. A photo will follow as soon as we receive it. We would like to thank all our customers and friends who visited in 2014 and look forward to seeing everyone who has booked for 2015! Badgers Holt – Klaus and Reiko from Germany had a great week landing carp of 28.3kg (62lb 4oz), 22.5kg (49lb 8oz), 21.7kg (47lb 12oz), 21kg (46lb 3oz), 20.6kg (45lb 5oz) & 17.2kg (37lb 13oz). The 28.3kg fish was a new PB. The fish were all caught on high quality fish meal boilies in open water spots. The water temperature dropped to 9C during the session with a lot of rain during the first half of the week. On Lac Serreire; Dave, Dan & Jay landed 16 carp including mirrors of 44lb (20kg) & 42lb (19kg) and a lovely common of 40lb (18kg). Most of the fish were to Dave’s rods in the Woods swim fishing straight out at casting range in open water over a bed of Nutrabaits Trigga boilies. Lac Serreire – John and Mark from the UK had a fantastic week landing 19 fish. John fished the Island Swim and Mark was in Tim and Mary’s swim. The carp were active with a lot of the really big fish showing which is typical for November, one of the best months of the year for the big ones. John and Mark had a great hit of huge fish with the best ones being; 68lb (31kg), 66lb (30kg), 64lb (29kg) and a 51lb (23kg) common. They also landed 5 more 40s and a number of good 30s. All the fish were caught on bottom baits fished in the silt. Baits were once again high quality frozen ‘food’ baits with good percentage of fish meal and krill included. Throughout the season, these ‘food’ baits have massively out-fished the pure ‘attractor’ baits that are so common on the market these days. In 2015 we will no longer allow shelf-life preservative based baits. Watch our website and Facebook page for more information during the winter or call us for a chat about bait any time. Badgers Holt was not fished this week. The anglers booked on have a two week booking and decided to rest the lake this week to give them the best chance of success during the week ahead. They have now started fishing so we will report how they do in next weekend’s catch report. 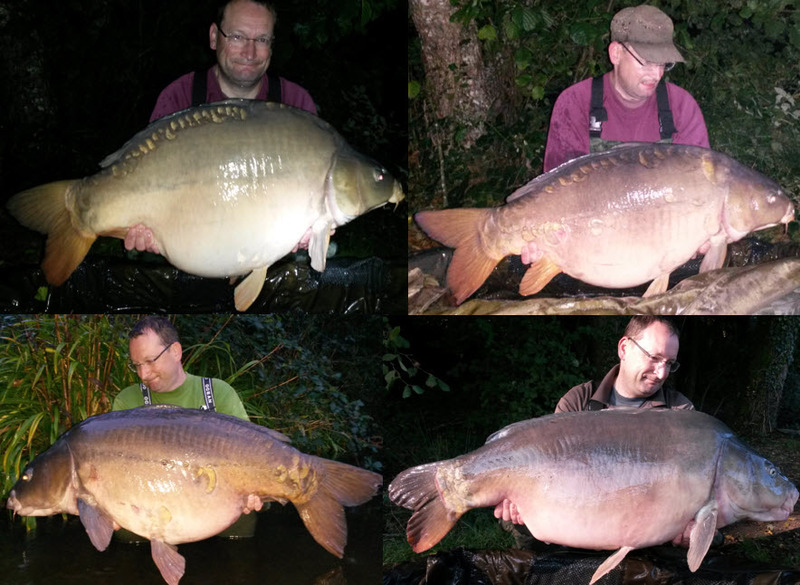 Pete and friends from the UK had a good week on Lac Serreire landing around 25 carp to 57lb 8oz (26.1kg). Top swims were the Shallows and Middle on the left bank and the Woods on the far bank. Up on Badgers Holt, Jurgo from the Netherlands landed an 18kg (40lb) common with a bait placed in Koi Corner. We hope to post some photos as soon as we receive them. Thanks guys! Lac Serreire produced around 25 carp with Trendy Trevor from the UK landing the biggest fish, a mirror of 45lb (20.5kg) from the Double swim. Trevor did well landing a number of fish from very close in the margins between the bank and the lily pads using Nutrabaits Trigga boilies. Over in the Shallows swim Fabian and Anja from Germany had a good week landing 11 out of 12 takes. Fabian did a great job finding the best spots at long range close to the far bank and consistently fishing them throughout the week. Up on Badgers Holt, Carl’s group from the UK had a hard week but landed a lovely 50lb mirror early in their session. Tim Paisley & friends had a very enjoyable week on Lac Serreire. Approximately 30 carp were caught with the best fish coming to Alan Taylor’s rods with a stunning 46lb (21kg) common from the Island swim. Top swim was The Shallows with Steve Guy landing 16 fish to 42lb 8oz (19.3kg). Nicely done Steve!! On Badgers Holt, Keith Williams and Tony had a good result with a common of 62lb 1oz (28.2kg) and mirrors of 54lb 8oz (24.8kg), 50lb 14oz (23.1kg), 46lb 12oz (21.3kg), 46lb (21kg), 40lb 2oz (18.2kg) & 32lb 4oz (14.7kg). The fish were caught in a variety of spots and often after the rods were left in for long periods of time. The fish were very active with a lot of showing and fizzing most of the week. Nice fishing guys and look forward to seeing you all again! This week has started really well with 3 fish out of Lac Serreire last night to 45lb (20.5kg) and a stunning 50lb (22.7kg) mirror out of Badgers Holt this morning. Full details to follow in next weekend’s catch report. The whole complex of Badgers Holt and Lac Serreire was fished by Paul Redhead, John Edwards and his sons from the UK. During the week, around 15 carp were caught including five 40s with Paul smashing his PB twice, the best fish weighing 48lb 8oz (22kg). Congratulations Paul! 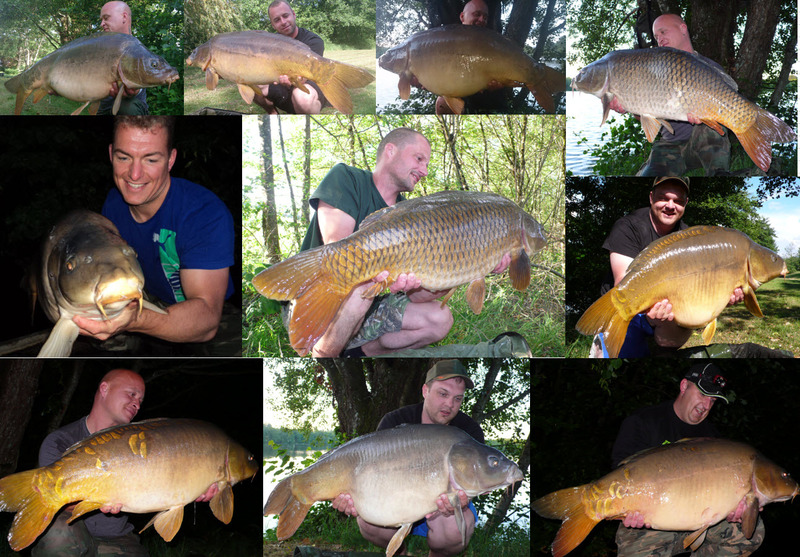 Lac Serreire was fished by Stefan, Norbert, Damian, David, Luca & Bjorn from Germany. It was a good week with approximately 30 carp landed including mirrors of 24.8kg (54lb 9oz), 23.7kg (52lb 2oz), 22.8kg (50lb 3oz), 22kg (48lb 6oz), 21.8kg (48lb) & 20kg (44lb). Top swim was the Woods swim where Damian and David had 18 fish. The Birches swim produced the 24.8kg fish from the lily pads in the outflow corner. Although this swim is rarely fished, it has produced a number of big fish during the last weeks. On Badgers Holt, Alex and Anthon den Boer landed 3 carp to 21.3kg (46lb 14oz). The fish were very active with plenty of showing and fizzing. The natural food is still plentiful in the lake, but as the water temperatures drop through the next weeks this will reduce, with one of the best times of year ahead during later October and into early November. Badgers Holt was fished by Manfred and Georg Zisler from Germany for the second week of their two week session. They caught a total of 8 fish; Mirrors of 18kg (40lb), 23kg (50lb 10oz), 22kg (48lb 6oz), 25.6kg (56lb 5oz), 20.6kg (45lb 5oz), 22.8kg (50lb 3oz) & 19.6kg (43lb 2oz) and a 30kg (66lb) catfish. The fish were caught on a variety of methods and in different areas. The carp were extremely active almost every day with a lot of fizzing and showing. There still seems to be a lot of natural food available to them. However the water temperature is slowing dropping so the naturals should reduce over the next weeks. Looking forward to seeing you next year Manfred and Georg! 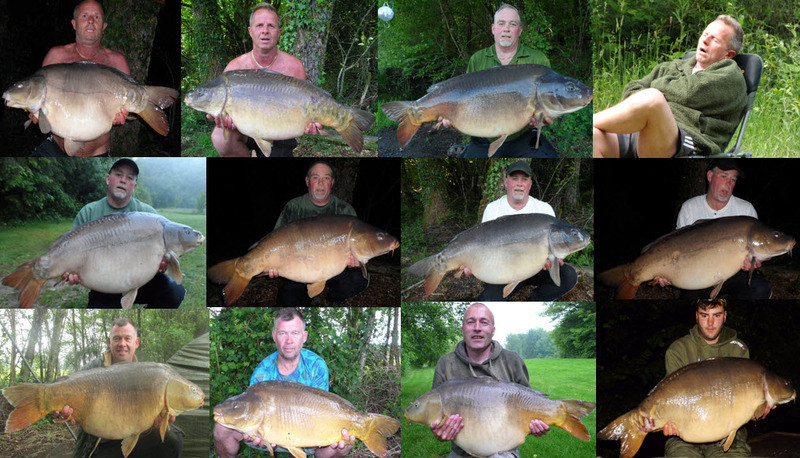 On Lac Serreire, Dave, Mark, Terry and Tony from the UK had approximately 9 carp to 41lb (18.6kg). The fishing was tricky with the fish mainly showing at long range in the centre area of the lake. Also looking forward to seeing you again in 2015! On Lac Serreire, the lads who started yesterday had a great start with 6 fish hooked and 5 landed in their first night including a PB. The largest fish so far was a 22kg (48lb) mirror. Full details to follow in next weekend’s catch report. Lac Serreire – Andy Hooper had a great session fishing the Woods swim landing 22 carp including mirrors of 47lb 1oz (21.4kg), 46lb 1oz (21kg) and 43lb 9oz (19.8kg). The fish were caught from a variety of spots with many coming from open water at medium to long range over good spreads of mixed Nutrabaits Trigga and DNA freezer boilies and Coppens Carpco Select pellets. In the Island swim, Chris Tulley had 4 fish including a massive 71lb 12oz (32.6kg) mirror. Successful bait was again Trigga fished over a bed of mixed Trigga and DNA freezer baits along with Coppens pellets. Congratulations Chris on the PB! Over in the Birches swim Stuart Arkell had 4 carp to 58lb 4oz (26.5kg) fishing to the pads in the outflow corner. Stuart caught using Active Bait Solutions fishmeal freezer baits. In the Shallows swim, Steve Ulph had 12 carp including 2 mirrors of the same weight at 43lb 2oz (19.6kg) each, again on the ABS baits. On Badgers Holt, Manfred Zissler and his brother completed the first of a two week session. Manfred has had three mirrors of 23kg (50lb), 22kg (48lb) and 18kg (40lb) so far. Full details of their session will be included in next weekend’s catch report. Lac Serreire was fished by three groups; Chris Swillen and his group caught 10 fish from Tim & Mary’s and the Island swims including two 50s in one night with fish of 25.2kg (55lb 7oz) and 23kg (50lb 10oz) within a few hours of each other. These were two PBs! Most of the fish were caught at long range in open water over a spread of boilies and pellets. Over on Badgers Holt, Ben and Alan Jenkins landed 11 carp; 2 x 50s, 7 x 40s and 2 x upper 30s. 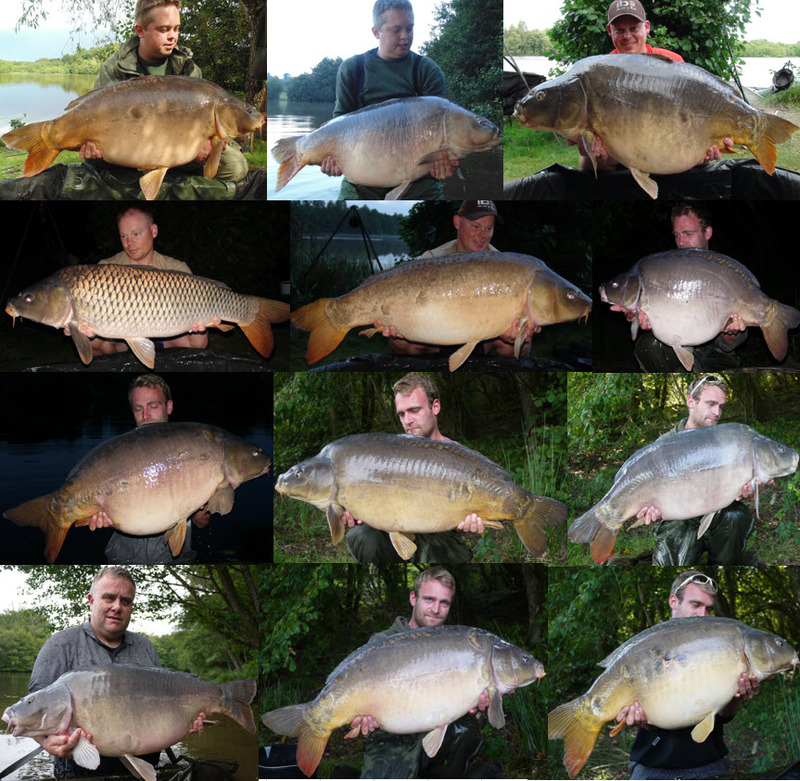 The best fish were mirrors of 54lb (24.5kg) and 52lb (23.6kg). A few fish were also lost due to hook-pulls. After car problems spoilt their first week of a planned two week session, it was great to see plenty of big fish landed including a PB for Alan. The fish were all caught on BaitWorks frozen boilies and mainly over mixed Coppens carp pellets and boilies. The fish were extremely active with rolling and fizzing, but definitely required a lot of thinking to get things just right to hook them (Ben nearly pulled all his hair out a couple of times!)!! Nice result guys!! See you next time! Latest news from Lac Serreire – The lads on this week had a 43lb mirror from the Shallows swim very soon after getting set up yesterday!! Nice way to start the week… More info in next week’s catch report. 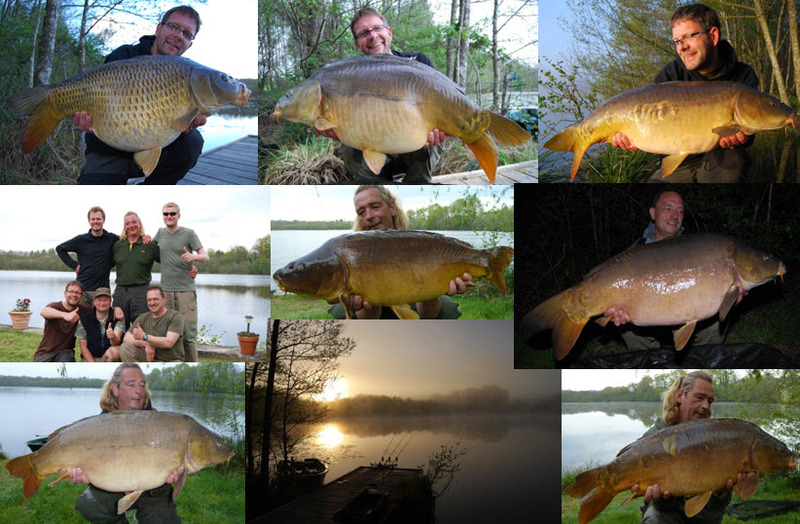 Lac Serreire fished well for Johan, Ivan, Patrick & Stefan from Belgium with 47 carp landed during the week. Patrick fished Tim & Mary’s swim and had 8 fish including mirrors of 26.95kg (59lb 5oz), 23.55kg (51lb 13oz) & 21.9kg (48lb 3oz) in a just few hours during the last night. The rest of Patrick’s fish during the week included a lovely 21.25kg (46lb 12oz) mirror and 4 good 30s. The 26.95kg fish was a PB for Patrick. It looks like the 59lb mirror will be a new 60 for Lac Serreire in the next few months as it has gained about 5 pounds since the start of this season. This very long fish has a massive frame and will be one to watch over the next years. In the Island swim, Stefan landed 17 carp to 20.8kg (45lb 12oz) fishing a variety of spots around the island, over to the lily pads and out in open water. Over in the Shallows swim, Ivan also had 17 fish with the biggest being a mirror of 19.1kg (42lb). Ivan did a great job only losing 1 fish all week which is good going for this tricky swim. In the Middle swim, Johan had 5 mirrors to 19.4kg (42lb 11oz) fishing mainly at long range towards the middle of the lake. Thanks for the great BBQ guys – Much appreciated! Badgers Holt was not fished all week due to the anglers having car problems. Ben Jenkins and his father from the UK were luckily booked on for two weeks. They finally arrived on Friday and had a great result with 4 big fish in the first 24 hours and a couple lost due to hook-pulls. The fish so far were 40lb (18kg), 40lb (18kg), 42lb (19kg) & 52lb (23kg). It looks like it should be a good week ahead and it is great to see Ben working non-stop, studying the water day and night, priming spots and applying the bait perfectly. The successful bait is again a high nutritional value frozen ‘food’ boilie fished over 16mm Coppens Carpco Select pellets. It is interesting to see time and time again that the fish have such a preference for these ‘food’ based boilies. Full details of the Badgers session will be in next weekend’s catch report. On Lac Serreire, Anthony and Jason ‘Bob’ Poolman from the UK had a great week’s fishing doubled up in the Woods swim. They landed 27 fish between them including 6 over 40lb (18kg) with the best 3 fish all going 45lb (20.7kg). They also included a number of good 30s, 3 catfish and a pike! Anthony and Bob did a great job by safe positioning of the baits and being right on the rods, with only one fish lost in the lily pads all week. The fish were caught on a mixture of Nutrabaits Trigga and Essential B5 boilies with most of the fish falling to bottom baits fished over Coppens pellets and a spread of boilies. In the Island swim, Lee ‘Carp Slayer’ Carrington had a hard week but landed a 21lb (9.5kg) mirror towards the end and unfortunately lost two. And over in the Birches swim, Kev ‘Doom’ Gibson had one mirror which unfortunately wasn’t weighed. On Badgers Holt, Kenny and Wesley Corstjens had 4 fish and lost a couple. The week started slowly, but after adjusting tactics and baits, things picked up in the second half of the session. The best two fish landed were mirrors of 21.7kg (47lb 12ox) and 21.1kg (46lb 7oz). Badgers Holt was fished by Martin and Ilona from Germany. It proved to be a difficult week with two fish caught; a mirror of 22.5kg (49lb 8oz) and a very rarely caught koi of 5kg (11lb). The mirror was a PB for Ilona – Congratulations & see you in the future! The lads on this week had a 43lb mirror from the Woods swim very soon after starting yesterday – Full report to follow in next weekend’s catch report. A fantastic week on Lac Serreire which was fished by John & Bea Lilley, Danny North, Mark & Mandy Bawden & Matt. Danny fished in the Birches swim and had an amazing week’s fishing with about 20 carp landed including mirrors of 66lb (30kg), 56lb (25.5kg) & 46lb (21kg) in the space of a few hours in one night breaking his PB twice! Danny also landed mirrors of 48lb (22kg) and 41lb (18.6kg) along with numerous upper 30s with only two fish under 35lb (16kg) all week. Most of Danny’s fish were caught out in open water over a good spread of bait. Mark & Mandy fished Tim & Mary’s swim with Mark landing fish to 52lb (23.6kg) & Mandy landing a 32lb (14.6kg) mirror. All the fish were caught on a really high quality, nutritional ‘food’ source, frozen bait and it was interesting to watch this group of very experienced anglers slowly but surely build up the baited areas and land about 65 fish with a very high average weight. This type of ‘food bait gets better and better as time goes on and also definitely seems to catch the bigger fish. Top fishing – Congratulations on the PBs and see you soon! On Badgers Holt, Bob Underwood had an excellent week with 13 carp landed. Considering the difficult fishing over the last few weeks, this was a really great result! 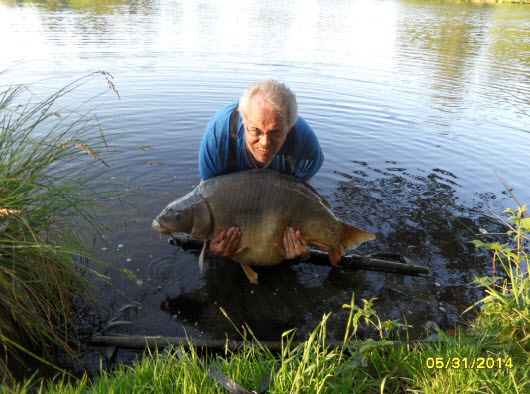 Six fish were over 40lb (18kg) with the best fish a 48lb 2oz (21.9kg) mirror. Bob worked hard with the spots and bait application which, at this time of year, is so important. With a high level of natural food available in the warm water conditions, bait selection is so important and frozen baits did the trick again. Great result Bob, see you in 2016! Badgers Holt was fished by Steve & Joan Briggs who had a fantastic week including a new PB with JoJo at 72lb 4oz (32.8kg). Steve also landed mirrors of 52lb (23.6kg), 51lb 2oz (23.2kg), 50lb 8oz (23kg), 48lb 8oz (22kg), 48lb (21.8kg), 47lb 4oz (21.5kg), 32lb 8oz (14.8kg) and a catfish of 66lb (30kg). Average weight for the carp for the week was 50lb 4oz (22.8kg)! All the fish were caught on freezer boilies fishing over quite a lot of bait (once again high quality freezer baits scored really well – The fish have a strong preference compared to shelf-life preservative baits especially when there is also an abundance of natural food available). Steve and Joan have fished Badgers Holt for 10 years and finally catching JoJo was a memorable moment and I think Steve hasn’t stopped smiling since! 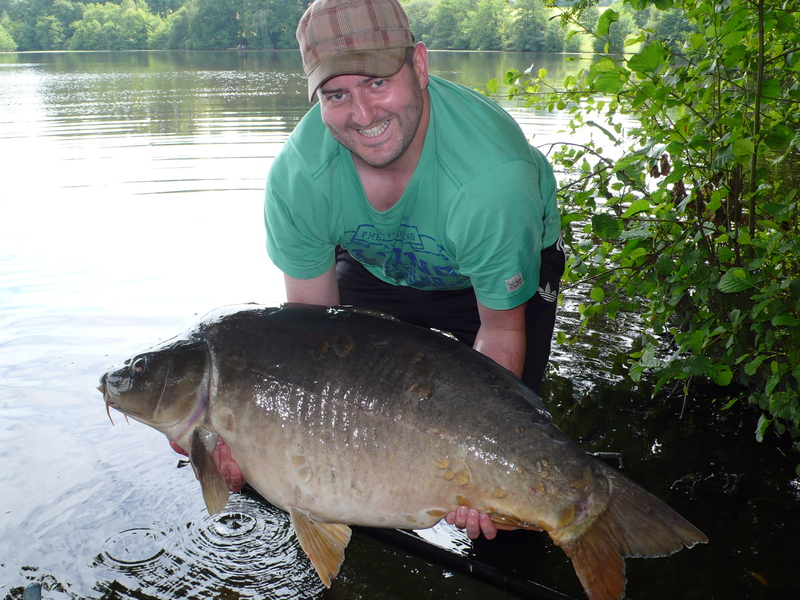 Congratulations Steve – See you next year on Lac Serreire for hopefully another even bigger fish!! 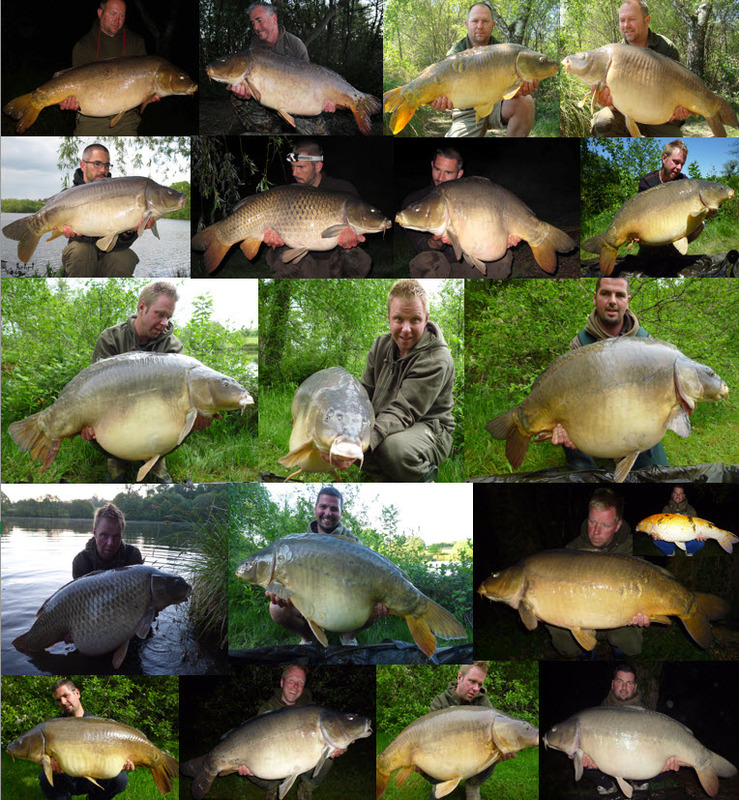 On Lac Serreire Jan & Reno Vos from The Netherlands landed 17 carp from the Woods swim to 22kg (48lb 7oz). Jan and Reno worked really hard at their fishing all week, watching the water, baiting spots and adjusting their approach. The work paid off with bother PBs being broken several times! Most of the fish were caught on snowman pellet / boilies rigs over a mixture of boilies and pellets. In the Shallows and Middle swims on the left bank, Torben, Patrick and Marten from Germany also worked hard with their fishing to land 14 carp with many of them in the 30lb (14kg) bracket. Most were caught on maize hook baits fished over beds of pellets and boilies. See you guys next year! In the Outflow swim, Nick from The Netherlands landed a few fish including a fantastic looking mirror of 18.8kg (41lb 5oz). Nick was also unfortunate to lose a couple of fish that felt good. And in the Island swim Leo also landed a couple of carp. Etienne Duits and his fishing partner from The Netherlands fished Badgers Holt for the week and landed 4 mirrors to 24kg (52lb 13oz). The fishing was tricky again but with perseverance it was possible to land some stunning fish. Steve and Joan Briggs are on Badgers Holt this week and had a great start with a 47lb (21kg) mirror this morning. Full report will follow next weekend. Lac Serreire was fished by Richard & Louis McQuade, Mark James and Stuart from the UK. 30 carp were landed with the largest two fish to Stuart in the Island swim with mirrors of 58lb (26.4kg) and 46lb (21kg). 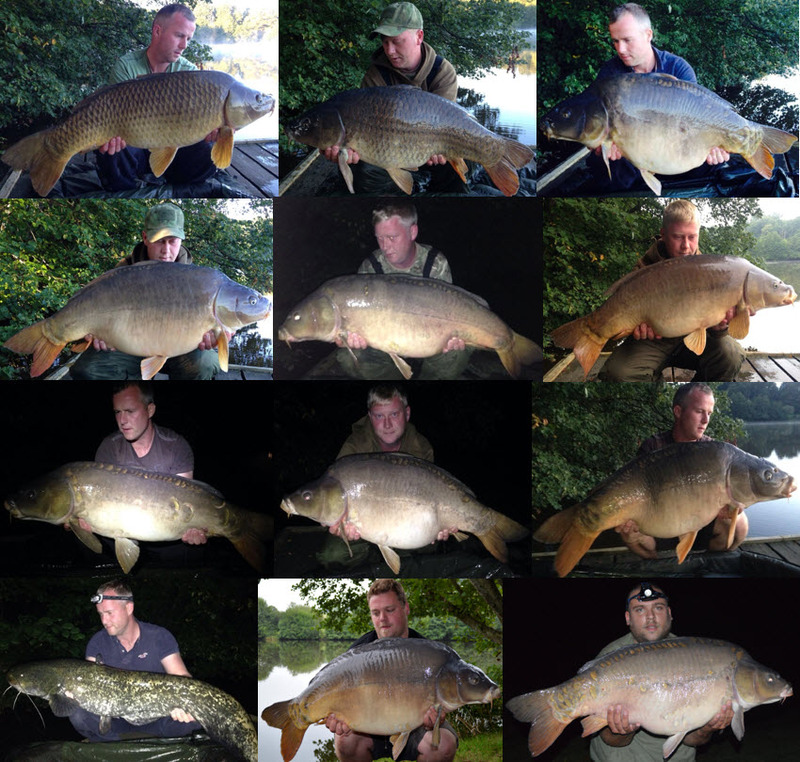 Mark landed 16 fish from the Shallows swim and Richard & Louis had 9 from the Woods swim. The fish were caught mainly over beds of boilies and pellets but fishing with balanced particles on the rigs to avoid any attention from nuisance fish. The biggest fish came, as usual, from the open water areas being fished. On Badgers Holt, the fishing continued to be tricky with many fish showing and a lot of feeding activity but no fish landed. The natural food again seemed to keep the fish quite preoccupied. Latest news…. After just an hour or two of fishing the lads on this week had a 50 (23kg) from the woods swim yesterday afternoon! Great start to the week! Full information will be provided in the next catch report next weekend. Lac Serreire was fished by Geert Verbiest and his team from Belgium (Genkies on tour!). 21 carp were landed and a few lost. Best fish was a lovely 20.5kg (45lb 2oz) mirror landed by Sam from the Middle Swim on the left bank. The weather was mainly very hot with a couple of thunder storms. The fishing was tricky due to high water temperatures and a lot of natural food available to the fish at the moment. Top swims were the Shallows and the Middle with a lot of fish holding up tight to the far bank opposite the Shallows Swim. Thanks again for the Belgium beer and see you again!! Badgers Holt proved a real challenge this week with one fish hooked on a zig rig and unfortunately lost and no other runs. The fish were active and showing a lot but proved very hard to temp despite many different rigs and baits being tried by the guys fishing. The very hot weather was probably the main reason. See you next year Peter! Badgers Holt was fished by Markus and Martina Rossing from Germany for the second week of their two week session. The weather was up and down and extremely hot during the last week with temperatures well into the 30’s. The fishing was quite challenging due to the weather and the natural food levels, but Markus and Martina still managed to catch 8 very big fish along with 3 hook pulls. Only one fish was under 20kg (44lb) with the weights being; 28.5Kg (62lb 11oz) common, 27.2kg (59lb 13oz), 23.4kg (51lb 8oz), 23.2kg (51lb 1oz), 21.8kg (47lb 15oz), 21.2kg (46lb 10oz), 20.5kg (45lb 2oz) & 19.5kg (42lb 14oz). The average weight for the session was 23.2kg (51lb 1oz) – Quite exceptional! Most of the fish were caught fishing close to the far bank tree line. Markus, we look forward to seeing you on Lac Serreire in April next year! Lac Serreire was not fished again during the last week due to a cancellation. There are six anglers on now from Belgium – Thanks for the Belgium beer and chocolates guys and good luck for your week ahead! Average carp weight this week 25kg (55lb)! Markus Rossing from Germany is half way through a two week session on Badgers Holt. In the last week he has landed 4 carp of 22kg (48lb), 23kg (51lb), 27kg (59lb) & 28kg (62lb). Again, the average weight of the Badgers Holt carp has been very high this week at 25kg (55lb)! More details and a full catch report will follow next weekend at the end of Markus’ session. On Lac Serreire, we had no anglers fishing this week so the carp were given a bit of a rest, a few kilos of Trigga and a few sacks of Coppens pellets to keep them happy and well fed. We are pleased to report that both Lac Serreire and Badgers Holt again produced big fish last week with a 29.4kg (64lb 11oz) mirror from Lac Serreire and the famous JoJo from Badgers Holt at 32.1kg (70lb 10oz). On Badgers Holt Peter van Loon from The Netherlands caught three huge fish and beat his previous PB with every one of them; 22.2kg (48lb 13oz), 25kg (55lb) and JoJo at 32.1kg (70lb 10oz). Peter used a variety of methods and baits including Nutrabaits Trigga combined with Coppens pellets, a combination which seems unstoppable this year. On Lac Serreire, Brian and Simon from Denmark landed 15 carp between them from the woods swim to 21.7kg (47lb 12oz) and Maikel and Dominik from The Netherlands landed 5 fish from Tim and Mary’s up to 29.4kg (64lb 11oz), another PB. Was fished by Wim ter Heide and his father from The Netherlands for a two week session which turned out to be the session of a lifetime! For Wim’s first week, the fishing continued to be difficult with the temperatures being very high and the fish appearing to be preoccupied on natural food most of the time. During the first week, Wim caught a couple of fish which were well earned after working very hard with various spots and tactics. 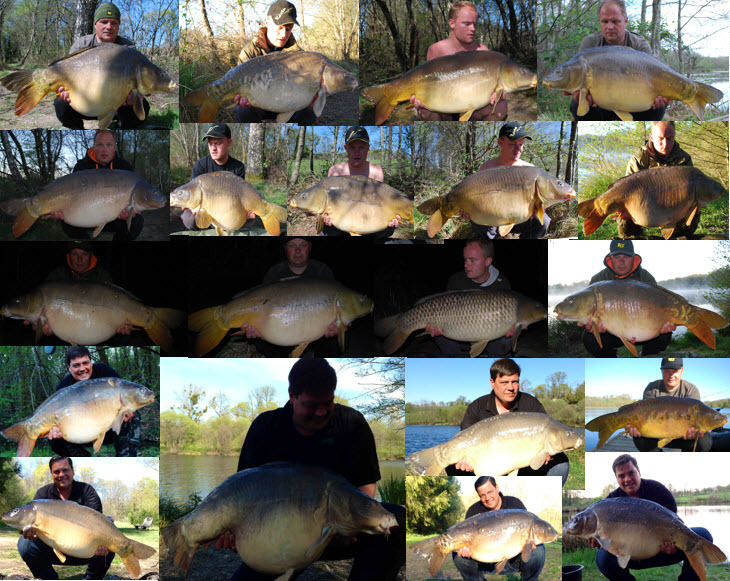 During the second week, everything changed and all the hard work really paid off with 23 carp being caught in the end. The number of big fish was incredible with 16 fish over 18kg (40lb) and 13 of those fish over 20kg (44lb), the best fish being 28.4kg (62lb 8oz), 26.8kg (59lb), 26.6kg (58lb 8oz), 25.4kg (55lb 14oz), 23.2kg (51lb 1oz) & 23.5kg (51lb, 11oz). The average weight for this session was 20.28kg (44lb 10oz). Great angling Wim, it was good to see all the hard work pay off during your second week! After the previous two weeks where Serreire fished extremely well, the fishing became a bit more challenging last week. There were 21 fish out to Dan Wrigley’s group from the UK with Dan W catching 6 fish from the Shallows Swim to mid 30’s. Dan A caught 5 fish from Tim & Mary’s Swim and the Island Swim’s to 46lb 14oz (21.3kg) – a move of swims half way through the week paid off. Paul had one from the Outflow Swim and Dave & Jay landed 9 fish from the Woods Swim topped by the huge 66lb 6oz (30.2kg) mirror as previously posted. Congratulations on the PB Jay – A real beast of a carp! Lac Serreire was fished by Lars Kock and his brother Ralf from The Netherlands and Andre Rittmeyer, Rene, Hagen, Frank and Robet from Germany. It was an excellent week with 65 fish landed. The weather was very hot with temperatures around 29-30C most days which encouraged many of the fish to start spawning at last. Lars and Ralf worked very hard at their fishing and were rewarded in the second half of the week with 10 fish from the woods swim up to 55lb and both had PBs – Congratulations (and sorry that you lost the much bigger fish early in the week!). Andre’s group had 55 fish with the best swim being Tim and Mary’s where Frank and Andre had a steady stream of fish all week mainly from open water. Andre, also congratulations on the PB! On Badgers Holt, Wim ter Heide and his father from The Netherlands are half way through a two week session. The fish on Badgers have still not yet shown signs of spawning and the fishing has been tricky. However, Wim has been fishing hard and successfully put 5 fish on the bank so far including a huge 26.6kg (58lb 8oz) PB mirror landed by his father earlier today. A full catch report and photos of from Wim’s two week session will follow next weekend. Lac Serreire was fished by the UK Preston lads Pete (the teacher), Mark (the apprentice), Gav and Dale. It was a great week with 60 takes and around 50 fish landed, mostly at night. The weather was very hot with temperatures around 29C the whole week. The fish still haven’t spawned, although a few of them were showing the signs of being ready. Pete, Mark, Gav and Dale all worked hard and some top angling was well rewarded with some stunning fish. All the fish were caught on Nutrabaits Trigga with pineapple and N-butyric flavor over beds of 16mm Coppens carp pellets. Mark was top rod and beat his PB with a 56lb (25.5kg) mirror along with around 15 others including two mid 40’s (20.5kg). Pete had 13 fish to 47lb (21.4kg). Both Pete and Mark fished the woods swim. On the left bank, fishing in the outflow corner, Gav and Dale had around 20 fish between them. Dale landed a cracking PB common of 46lb (21kg) and Gav had mirrors of 49lb 8oz (22.5kg) and 44lb (20kg). Twice in one day Dale ended up with two fish on at the same time. 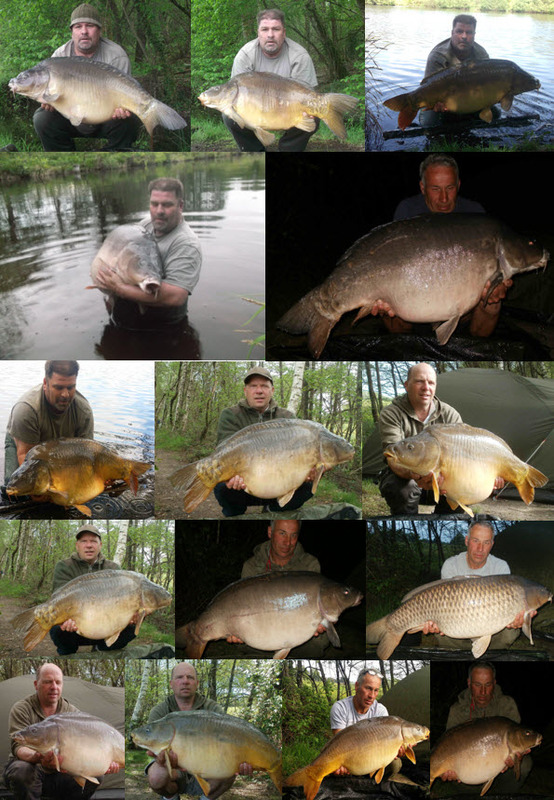 On Badgers Holt, Roger van der Vaart and Victor from The Netherlands had 5 fish. It was a hard week with the high temperatures. Best fish were 25.05kg (55lb) and 22.8kg (50lb 3oz). In particular, the 25kg fish was an absolute stunning mirror (see photo in the water). On Badgers Holt the fish have also not yet spawned. Badgers Holt was fished by Hans Schepers and his companion from The Netherlands. It was a hard week with the fish not as active as usual. The guys still managed to land 5 five including JoJo at 32.68kg (71lb 14oz) and also a cracking 20Kg (44lb) common. Thanks for the photos guys (and also for leaving the cabin immaculate – Much appreciated!).. On Lac Serreire, Vitus Scholten and his group caught around 25 carp including PBs for all 5 anglers. Best fish were 23kg (50lb) and a number around 20kg (44lb). Vitus, please could you email us some of your photos? Thanks..
Once again the unsettled weather did not help this week’s anglers. We had a mixture of heavy cold rain, northerly winds and a few sunny days. The fish are close to spawning with some initial signs with the Lac Serreire carp last week. But the weather caused the water temperature to drop a degree or two again and prevented them getting on with the spawning this week. 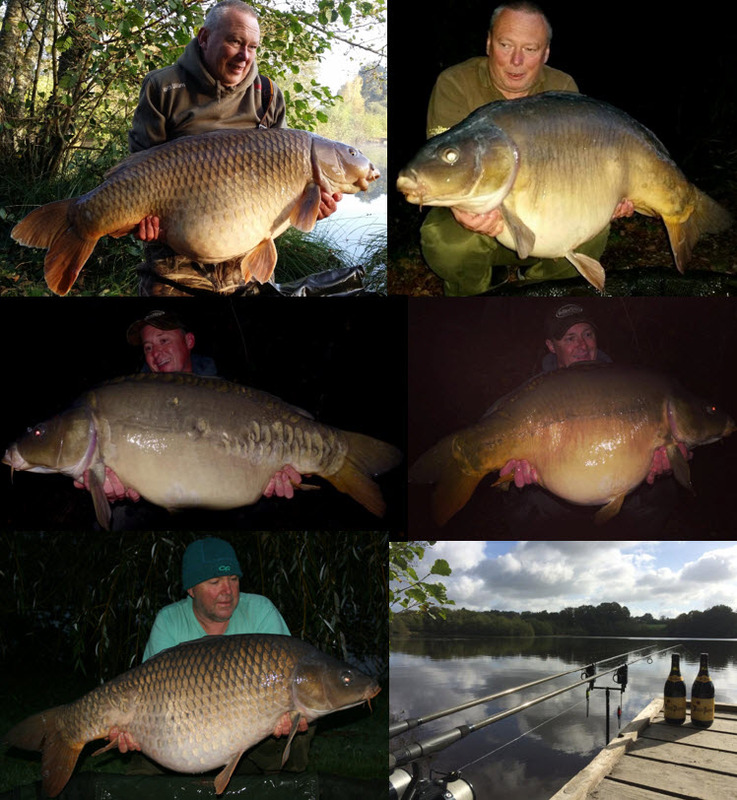 On Badgers Holt, Paul Biggs and Bob Hobbs from the UK had 9 carp with all except one of them over 40lb (18.2kg). 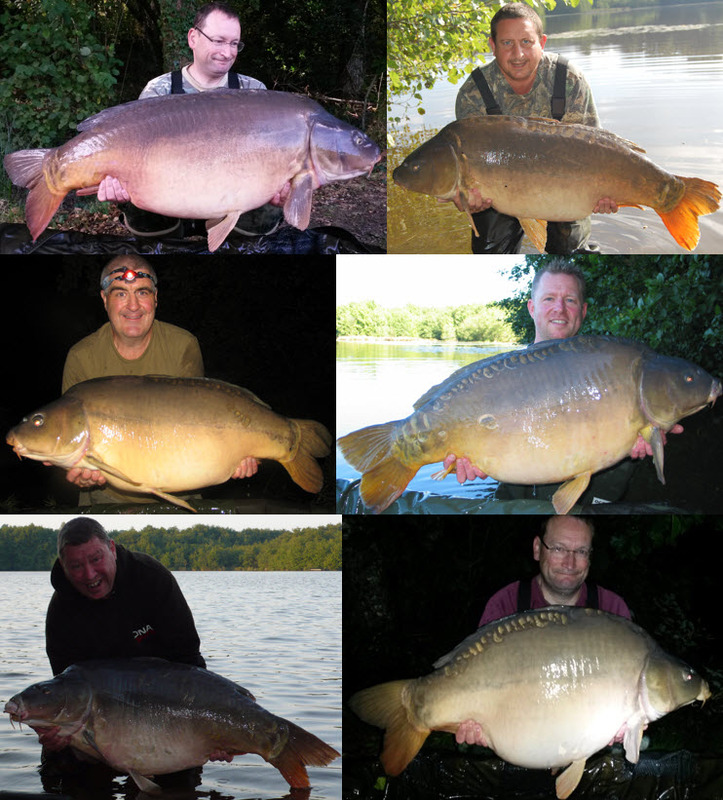 They ended up with fish of 48lb, 48lb, 41lb, 48lb, 42lb, 45lb, 46lb, 34lb & 52lb. With an average weight of just under 45lb (20.5Kg), this was a very good week’s fishing! On Lac Serriere, four UK anglers fished and Anthony and Mitch had PBs. There were 17 fish out with Anthony catching 14 them from the shallows including mirrors of 56lb 8oz (25.7kg) and two 47lb (21.4kg) fish. Mitch had 3 fish to mid-fifty mirror from the Woods swim. Congratulations on all the PBs! The weather was again very changeable with cold NE winds and storms during several of the days – Far from ideal fishing conditions. Despite the conditions, Mark Botten and Lee Wood had a great week on Badgers Holt with a total of 17 carp of which 13 were over 40lb (18kg) . The best two fish were 54lb 12oz (24.9kg) and 54lb 8oz (24.8kg). With 75% of all the fish caught being over 40lb, this was another exceptional week’s fishing. On Lac Serreire, Dave Collings and Chris had 33 carp with Chris landing the biggest fish at 48lb (21.8kg). Dave and Chris had plenty of 30s and four 40s between them. Dave fished the woods swim and had a lot of fish in the very shallow water to the right of the swim. Chris fished on the opposite side in the shallows swim also catching his fish in very shallow water. During the one really sunny day of the week the fish showed the first signs of spawning. The fishing was hard because of the conditions, but Dave and Chris persevered and fished hard all week earning every fish to end with a good final result. Another great week’s fishing on both Lac Serreire and Badgers Holt. On Badgers Holt, Berry Korver and Michael from The Netherlands landed 14 fish including JoJo at 32Kg (70lb 6oz), The Big Common at 27.2kg (59lb 13oz) and a 25.8Kg ( 56lb 12oz) mirror along with 4 other fish over 20kg (44lb) meaning 50% of the fish were again over the magic 20Kg (44lb) weight! They also landed one of the koi carp at 11.5Kg (25lb 5oz). Congratulations on both smashing your PBs!! Nice fishing – See you next year on Lac Serreire! On Lac Serreire, Barry Coomber and Jamie from the UK had about 10 fish from the shallows and middle swim including a cracking long 54lb 9oz (24.8Kg) mirror to Barry and a 44lb (20Kg) mirror to Jamie. At the other end of the lake, in Tim & Mary’s and the Island swims, Rainer and Sasha from Germany had about 8 fish to over 20Kg (44lb). Fishing was hard due to very strong and cold north easterly winds most of the week combined with some heavy rain. Not ideal conditions so all the fish caught were really well earned! A fantastic week on both lakes with the complex record being beaten as previously reported and several new PBs! 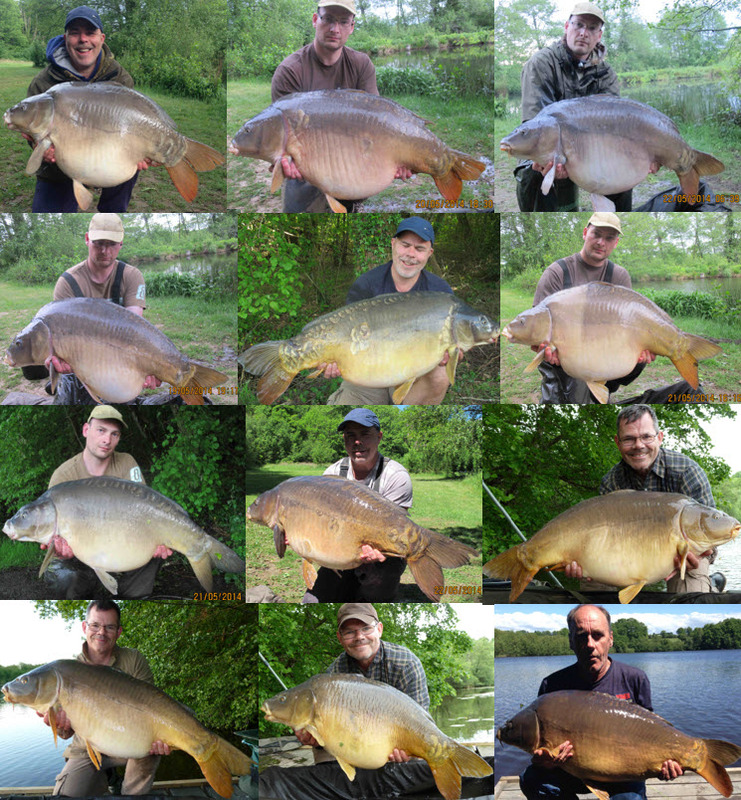 On Lac Serreire, Shaun Fursland and Ian Pyke from the UK had 33 fish between …them. These included a PB and lake record mirror of 76lb 12oz (34.9kg), a PB common of 46lb (21kg) and a PB catfish of 84lb (38kg) to Shaun’s rods. The majority of the other fish were 30’s and 40’s making this a session to remember! On Badgers Holt, Tomi Walch and Dietmar Norz from Austria had 10 fish with Tomi beating his PB twice in 24 hours with a 25.5kg (56lb 2oz) mirror and then later JoJo at 30kg (66lb). During the same day he also caught mirrors of 22kg (48lb 6oz) and 18.8kg (41lb 6oz). Dietrmar also had mirrors of 17.7Kg (38lb 15oz) and 21.4kg (47lb 1oz). The fish were tricky to catch and a lot of different rigs and tactics were tried before the first fish was caught on Tuesday after three days of hard work. The week then got better and better as time went on. Congratulations to all – What a week! Despite non-stop rain, cold winds and overall poor weather conditions, a lot of big fish were again caught from both Badgers Holt and Lac Serreire. Geert and Arjan from The Netherlands worked hard all week and had a hit of big fish from Badgers Holt ending up with 24 fish with 12 of them over 20Kg (44lb) including JoJo at 31Kg (68lb 3oz) and the big common at 26Kg (57lb). The number of big fish coming out of Badgers Holt is amazing and this week’s average weight was a little over 18.5Kg (40lb 11oz). Congratulations and thanks guys for some really good quality photos! On Lac Serriere, Roel Bocken’s group from Belgium fished hard all week ending up with around 35 fish topped by the previously reported massive 29.2Kg (64lb 4oz) mirror to Bisschops Maarten. On the last night of their stay it was also nice to see another well earned 23kg (50lb) mirror out. The weather really didn’t help, but in the end everyone had a great week. Hope to see you again in the future! Badgers Holt continued to fish really well with Klaus Wegmann and Phil Braun from Germany ending up with 25 carp. 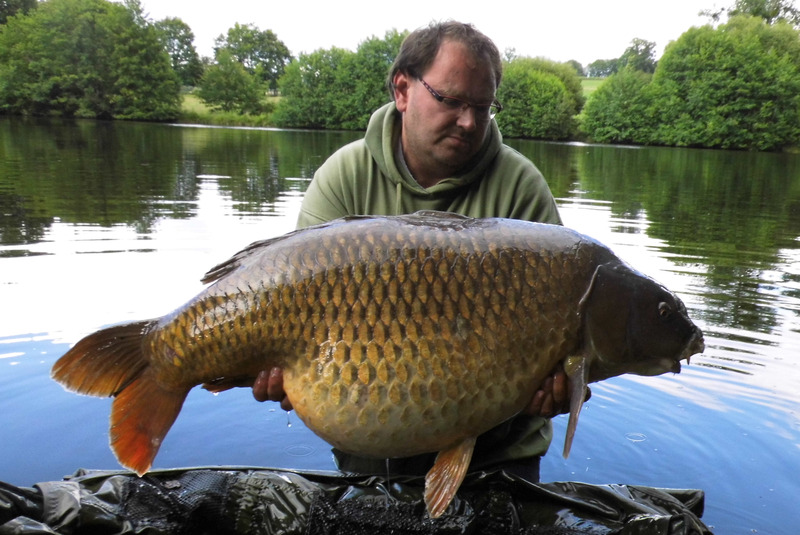 It was the session of a lifetime for Klaus with his big common of 26kg (57lb 2oz) as previously reported. Klaus went on to land a string of big fish including a number of mirrors well over 20kg (44lb). Phil also caught a lot of fish including a number over 20kg. Phil was filming for part 2 of his DVD “Phil in France”. The filming was excellent with a lot of live footage showing big fish being played, netted and weighed. Phil also goes into detail about his rigs and tactics that again proved successful at this sometimes tricky water. Many of the photos of this week’s Badgers Holt fish will be released by Phil and Klaus in the run of time as part of the DVD and in magazine articles, etc. Part 2 of the DVD will be something special and highly recommended! Lac Serreire also produced some good fish up to 23kg (50lb) for the group led by Jeroen Albers from Germany. Serreire is producing a high number of carp in the range of 15-23kg this year. It is impressive to see so many 40lb+ fish on the bank and these fish are growing fast. Thomas from Germany caught the largest couple of fish of the week fishing over a lot of boilies at long range near the center of the lake using chod rigs. In the silty conditions, the chods are an excellent option to guarantee that the hook bait is presented effectively. Today we carried out the first cutting back of the lily pads of the year which will help with landing fish over the next weeks. We plan to keep these under control throughout the season. Thomas Kamin from Germany fished Badgers Holt and had his best week’s fishing ever beating his PB several times during the week. Thomas ended up with 15 fish in total, with 10 over 40lb (18.2Kg) including JoJo for the second time this year at 66lb 7oz (30.2Kg). Congratulations Thomas and looking forward to seeing you next time! On Lac Serreire, Henry van Ekeris and his group from The Netherlands had around 60 fish including a couple of stunning mirrors of just over 50lb (22.7Kg) and a lot of 30s and 40s. The Serreire fish were again quite shoaled up in the shallows and the outflow corner areas where the shallow water is warming up quickly. Martin Nieuwland & Marco Geilvoet from The Netherlands had an amazing week on Badgers Holt catching consistently throughout the week and ending up with 27 fish including 17 over 18Kg including JoJo at 30.6Kg (67lb 5oz). The number of really big fish caught was remarkable. Martin and Marco worked hard the whole week adapting their approach and the spots continuously. Congratulations guys on two new PBs – Great fishing! On Lac Serreire, John Fuch’s group of four anglers from Germany had three PBs as well including mirrors of 20.5kg and 22.8Kg. Overall about 20 carp came out and most of the fish were caught in the shallows. The water is rapidly warming up now due to the recent sunny weather and over the last days the fish have been caught often in just 50cm depth of water. Thanks guys for the present for our dog by the way!! We hope to see you again. Great first week of the season on both Lac Serreire and Badgers Holt! Lac Serreire was fished by a group of anglers from Germany and, despite less than perfect weather conditions, they had a great result with 50 carp caught. Klaus Wegmann and Thomas Klak had approximately 40 carp from the left bank (Shallows swim and Middle swim) topped by Thomas catching a 68lb 4oz mirror on the last morning. Klaus Broxtermann had a huge common of 60lb from the opposite end of the lake in the Double swim. Markus Lilienbecker even managed to catch a 1.8m Pike accidently on his carp gear. On Badgers Holt, Arjan Biemond and Karlien from The Netherlands had a really good start with 12 carp hooked and 9 landed including three over 40lb, the biggest being a 46lb mirror caught late in the week. Thomas with his 68lb mirror – Congratulations on the PB! !